Be confident when you buy. A built-in USB port makes data transfer ultra-convenient. 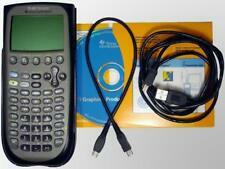 Perfect graphing calculator for advanced mathematics, physics, engineering and statistics. I/O port for communication with other TI products. Includes Backover, Cable, Getting Started Guide. Lightly USED, In Excellent Condition. Does not include battery cover. Tested and working. Type Graphing. Custom Bundle No. Power Source Battery. Modified Item No. SKU: TI89TITANIUM. A built-in USB port makes data transfer ultra-convenient. TI-89 Titanium Graphing Calculator TI 89 Calc. Product Type: Graphing Calculator. Manufacturer: Texas. Calculator Features: Clock. Type Graphing. Model TI-89 Titanium. To your consideration this. Battery powered (4 AAA). Battery door. Power Source Battery. Power Source Power Cord. Front cover. Sling Shoulder Case For Nikon D7100 D7200 D7000 D5300 D5200 D3300 D3200 D3100. Hard Graphic Calculator Carry Case for Casio FX-7400G PLUS | FX-7400GII. Aluminium Binocular Tripod for Celestron TRAILSEEKER 8X42 | SGODDE 16 x 52 kourosh8907(270). High quality 3D printed Battery Cover for TI-84 Plus & TI-89. Default colour of cover is Black, If you would like a different colour feel free to request this in your order notes. Type Graphing. Power Source Battery. UPC Does not apply. IN GOOD CONDITION~. Model TI-89. Texas Instruments TI-89 Graphing Calculator * Tested *. Condition is Used. Works perfectly Shows signs of wear Shipped with USPS First Class Package. USED BUT NOT ABUSED.WHAT YOU SEE IS WHAT YOU GET. We are here to exceed your expectations. ——————————————————————. (Which is usual cheaper). This is handled on request! Texas Instruments Ti-89 Titanium Graphing Calculator - TEXTI89TITANIUM. Condition is New. Shipped with USPS First Class Package. This versatile graphing calculator features advanced functionality and 3-D graphing that makes problem-solving for AP , advanced mathematics and engineering courses easier. Condition is Used. Up to 99 graphing equations defined and saved for each graphing mode. The TI-89 Titanium lets you perform basic math, algebra, calculus, graphs, matrices, and statistical functions and creating animations, graphing 3-D rotations, and plotting contours. The TI-89 Titanium's flash technology allows upgrading to future software versions without having to continually invest in new calculators. Texas Instruments TI-89 Titanium Calculator With Cover (Working)! About this product Product Information Type away and solve complex mathematical problems with the push of a few buttons. With its sleek design, this TI-89 Titanium calculator looks as smooth as it functions. This model uses a dot matrix display and an LCD screen. Its screen size is 3.2 inches diagonally. The TI-89 gives you the ability to check your answer and enter basic information in stored programs. Ample storage makes saving functions for future use quick and easy. It has a preloaded computer algebra system (CAS). This allows you to perform functions used in engineering and science-related fields. Use the TI-89 Titanium graphing calculator to calculate derivatives, differential equations, and algebra. It is ideal for students who are taking AP calculus, college calculus, and other math classes. USED/WORKS 100%. THERE ARE LITTLE TO NO SCRATCHES ON BOTH THE UNIT AND ITS SLIP COVER.SEE PHOTOS FOR FURTHER DETAILS. AMAZON BASICS BATTERIES. SLIP COVER. • Professional Service. (If it's not listed below, it is NOT included!). 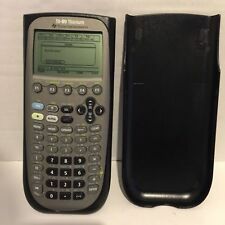 Texas Instruments TI-89 Titanium Graphing Calculator No Cover. Battery compartment is clean and the small backup battery has just been replaced. Condition is Used. Shipped with USPS First Class Package. Good working condition. Has scratches and scuffs from use. This calculator is part of a lot. It is generally in good condition with very little screen wear. There is no intentional writing and there are no engravings on the calculator. Please read full item description for complete details. The calculator, manual, cable and disc have minor wear on them from normal handling and use, see photos and use the zoom tool. Overall, the calculator is in excellent condition and is fully functional. Texas Instruments TI-89VSC Graphing Calculator. Condition is Used. Shipped with USPS First Class Package. Graphing calculator handles calculus, algebra, matrices, and statistical functions. Works Well - Batteries not included. Input/output port and cable, also supports optional TI-GRAPH LINK. Computes symbolic solutions to differential equations. High-resolution display with split-screen views. Texas Instruments TI-89 Titanium Graphing Calculator Stickered Has stickers on case and cover. Has scratches, scuffs and marks. Works well. Shipped with USPS First Class Package. Texas Instruments TI-89 Graphing Calculator. Condition is Used. Shipped with USPS First Class Package. The calculator is in excellent condition. The display is great, all a keys respond perfectly. Fully tested. 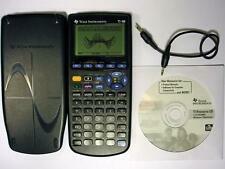 Excellent working Texas Instruments TI-89VSC with hard cover Graphing Calculator. Name is etched on back ... covers up easy ... Super clean battery case , no battery corrosion!! TESTED WORKS PERFECT !!! 4 AAA BATTERIES NOT INCLUDES .. Shipped with USPS First Class Package.